A small Okarito business is walking the talk with their approach to conservation and protecting wild spaces. Paula and Swade from Okarito Boat Eco Tours operate their business with an extremely light footprint and love to introduce visitors to the beauty of the wildlife and environment while educating about the importance of the wetlands, birds and plants. 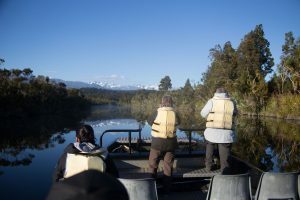 Their boat trip takes small groups through the Okarito lagoon to see fish and birds in amongst the peaceful, natural environment with a jaw dropping view of the Southern Alps in the background. They stay true to their eco policies by travelling only once per day a few hundred metres to launch the boat and then they use low power and travel at very slow speeds often cutting the motor to drift, watch and listen. Other than heating water for morning tea, they use virtually no electricity running their business and their office has no electricity at all. When not out on the boat the couple are kept busy planting trees, assisting the Department of Conservation, working in the Okarito native tree nursery or in their own abundant vegetable garden.